Twenty-two-year-old disabled England archer Danielle Brown tells Harish Kotian the Commonwealth Games is a 'lifetime opportunity' to prove her worth. 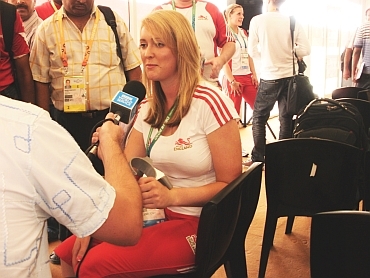 For England archer Danielle Brown, the Delhi Commonwealth Games is a new beginning. The 22-year-old gave up all hope when she was left disabled by a chronic pain syndrome. But there was light on the horizon when she was called up for selection trials for the Delhi Games. And, exceeding all expectations, including her own, she did better than the able bodied athletes and secured a place in the England team. 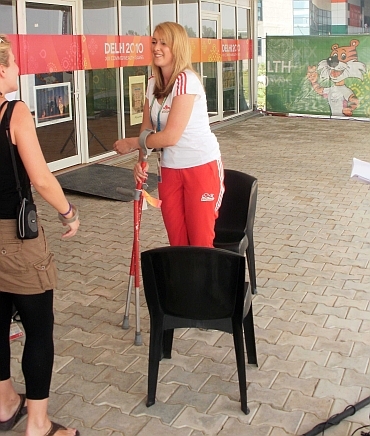 And Brown's excitement was evident as she faced the press at the Games Village. "I am very excited and I am glad that I got this opportunity. It is the first time that archery is being included in the Commonwealth Games and it is not going to be in the next Games in Glasgow, so this could well be a lifetime opportunity." Brown, who becomes the first Paralympian to represent England in an able-bodied event, will take part in the compound women category with Nicky Hunt and Nicola Simpson. 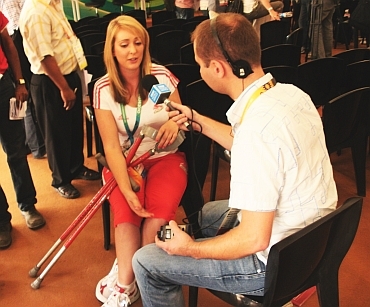 She revealed how the disability, which forced her to use the wheelchair to move around, struck her when she was aged 13 and she had to give up all sports. "I got a chronic regional pain syndrome in my feet which meant that at the age of 13 I had to give up all sports that I had previously done. I didn't actually consider myself as disabled at the time and I didn't know anything about paralympic sport in general because there was not much media at the time and there was not much information," she said. "So I thought since archery does not involve much running I thought I could do it. At the start I had problems collecting my arrows but it is really good fun and that is how it started. "It started at 11 and by 13 I had to give up all my sport. I used to do running, I was not good at it but my dad used to enjoy it. I also played golf, did a lot of walking and cycling," Brown added. The ace archer was also all praise for the facilities at the Games Village, and said all the arrangements for handicapped athletes are also taken care of. "The wheelchair accessibility and the rooms are absolutely fantastic. Last year at the World Championships, we could not even get the wheelchair through the bathroom doors, so all the guys were in the wheelchair permanently. "So if you had to use the toilet in the middle of the night, you had to wheel down to reception, which was just a complete pain. Around the Games Village there are a few bumps that are difficult to get over but, mostly, it is absolutely fine," she said. But it has not been all smooth sailing for Brown; as she points out, even the basic task of getting up from the bed is a painful one for her. "With my disability I had to be mentally strong. For me, the worst time of the day is morning when I have to get out of bed and it is just a nightmare being in so much pain. I just had to put all that to one side, so I guess in the sporting sense that also helps me. I had to develop strategies to cope with the pain," she explained. Brown nearly missed the trials believing that she would not get the better of the able-bodied athletes, as archery also requires a great deal of balance and strength. "I thought I probably could not last because the competition in archery in UK is absolutely phenomenal. And I was doing my third year of law degree in the University and I thought I have just given 10 days of my revision schedule to go to Arizona, so I thought I was not going to bother turning up. "But my boyfriend, who is also my team-mate in the England team, told me that this is once in a lifetime opportunity and that I really had to do it. So I was coerced into doing it and now I am really glad that I did it. I think because I was really under no pressure and I was thinking that I was jet lagged and I may not do well, but I just shot really, really well," she added.